We are hosting Thanksgiving dinner in eight days, and haven't as much as bought a turkey! Time to spring into action, I think! 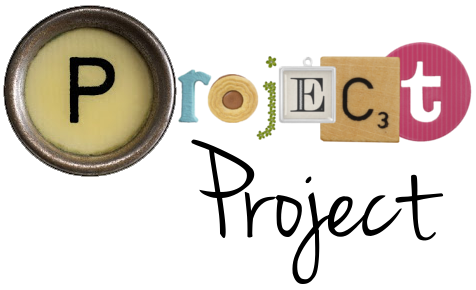 Fortunately, we will be dividing food assignments between the three families that will be attending at our house, so we won't be doing all the cooking ourselves. 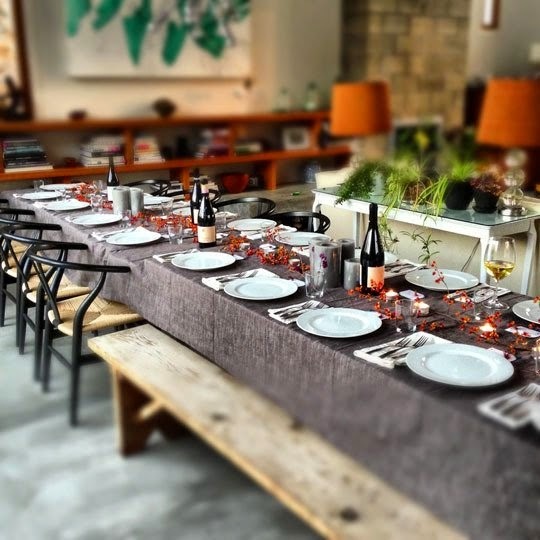 But we are responsible for setting the scene for a special holiday meal with the family, so today I am thinking about tablescapes. You can keep the crystal chandelier, but I'll take the centerpiece, thanks! Our house isn't exactly the place for starched linens, gleaming silverware and wall to wall formality, so this year I'm toying with the idea of a fairly modern, casual look that still feels festive and special. Last year's table was pretty, but very simple, and I am feeling more like kicking things up a notch or two this year. 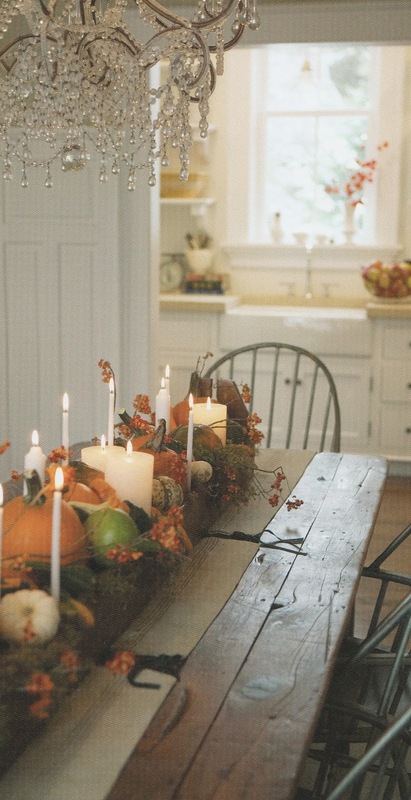 I feel like a Thanksgiving table should have have some elements of nature to it, and maybe especially a harvest vibe, given the roots and origins of the holiday. Plus, it's often the last chance we have to bring the outside in before winter really kicks in, so why not take advantage while we can? A slightly more fall-themed version of this, perhaps? I don't like centerpieces that are so big that they get in the way of conversation (or crowd your eating space), beautiful though they may be! Instead I am thinking of doing something low that goes the entire length of the table, utilizing the empty space in the middle of the dinner table. I like the idea of a long, narrow wooden box filled with pumpkins, leaves and berries, but I don't think I'll get one put together in the next week. Maybe next year? I'm actually really loving the simple, clean beauty of this table borrowed from Apartment Therapy, even if the tilt shifty focus of this photo is making me slightly seasick. I like the simple white plates against the dark table cloth, and those red berries are just the right accent. Thank you card as Thanksgiving napkin holder. Pretty clever! The small details are what really takes a tablescape from something pretty to something really special. 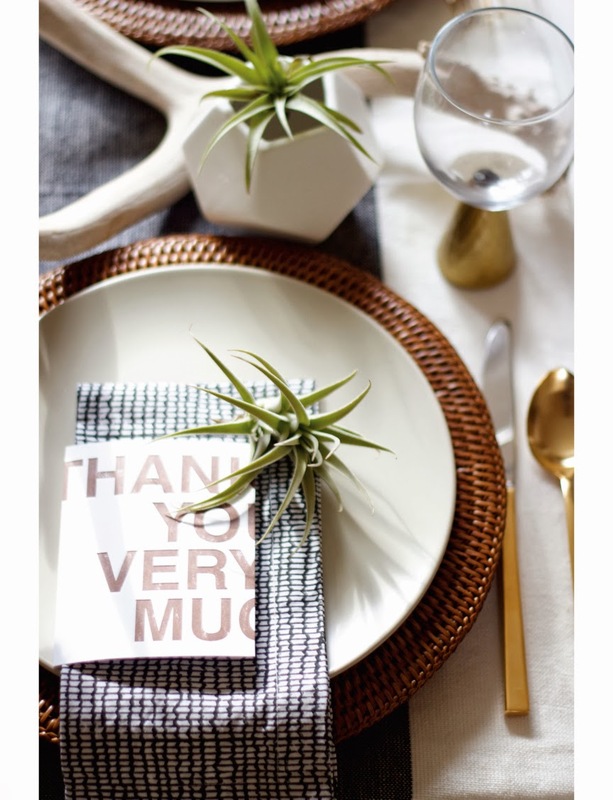 I love the simple graphic thank you cards used in lieu of napkin rings pictured above (although I'm not completely digging the idea of having a succulent slapped on my plate). These little rosemary wreaths are really sweet too. The plate and silverware are too ornate for me, but the place card is spot on. Confesh: I love place cards, and think I have saved most of mine from the various formal dinners I have attended over the years. 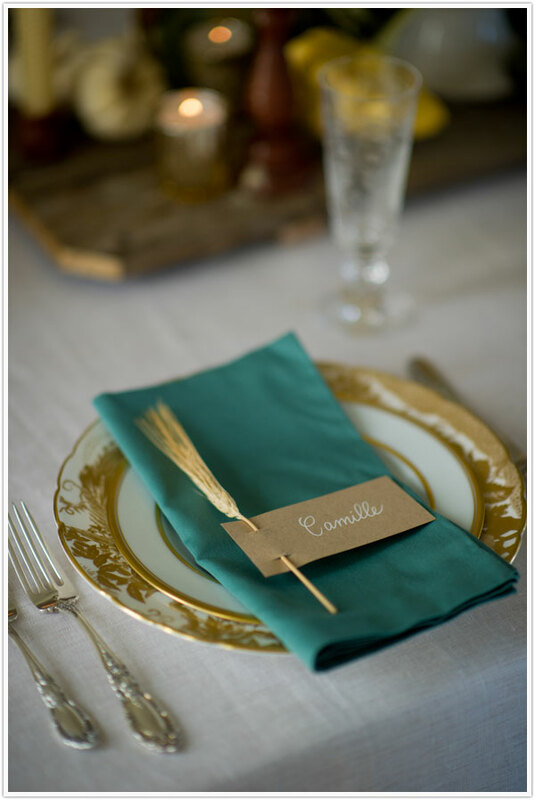 Place cards clearly state that "this is a special occasion", which begins to make it a special occasion. Plus they give you some control over who sits with whom, so grumpy aunt Jean doesn't get stuck between two sticky toddlers, and the newlyweds won't have to risk being separated for the duration of the meal (although that might not be the worst scenario in the world!). I'm kind of digging these gilded pears, but also like the simplicity of the single sprig of wheat pictured above. I'd like combine the look of those with these Rosemary Sprig place cards. And then you need that something special, the dot over the i, as we say in Norwegian. That one thing that is just the right thing, and that ties everything together just so. The thing that catches people's eye and tells them that they just arrived at a party. Or at least a very special dinner with family and friends, which is nothing to be sneezed at either. So, those are my thoughts for our Thanksgiving table. Now tell me yours!